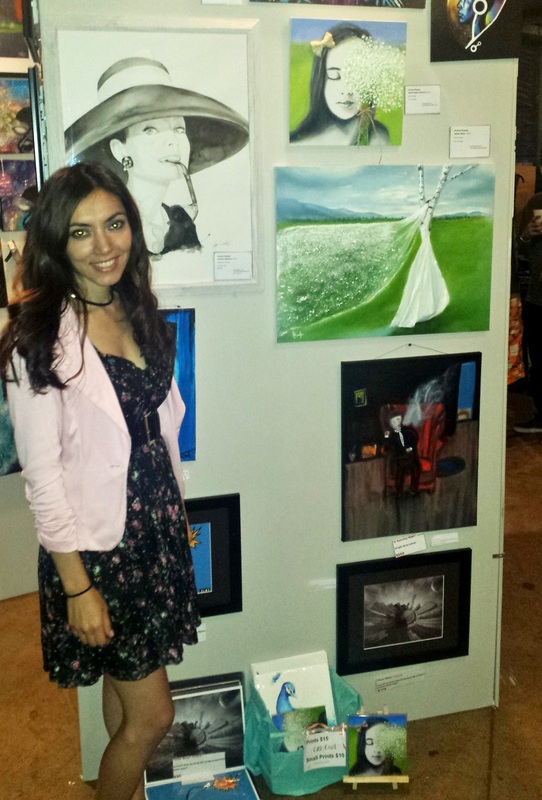 The art show event was a success! 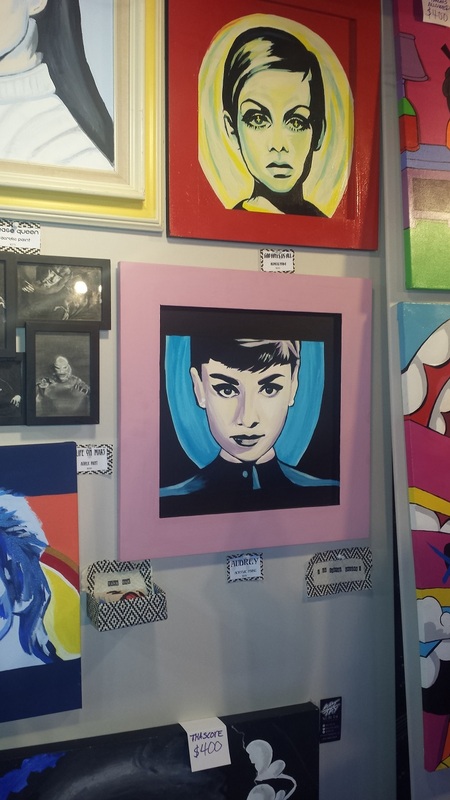 Over 80 emerging artists displayed their artwork at Reggie's Rock Club. The event also included live audio performances, live body painting and a free pancake bar! The pancakes were absolutely delicious. The blueberry pancakes and the chocolate chip pancakes were my favorite! Ray did a wonderful job painting this piece. The sunflower captured my eyes instantly. I especially like how Ray combined a gloomy like atmosphere and then brought in powerful elements of surprise; the sunflower and large cat. The gorgeous yellow flower ads positivity to the misty landscape. It is very aesthetically pleasing. This is one of my favorite paintings from the show. 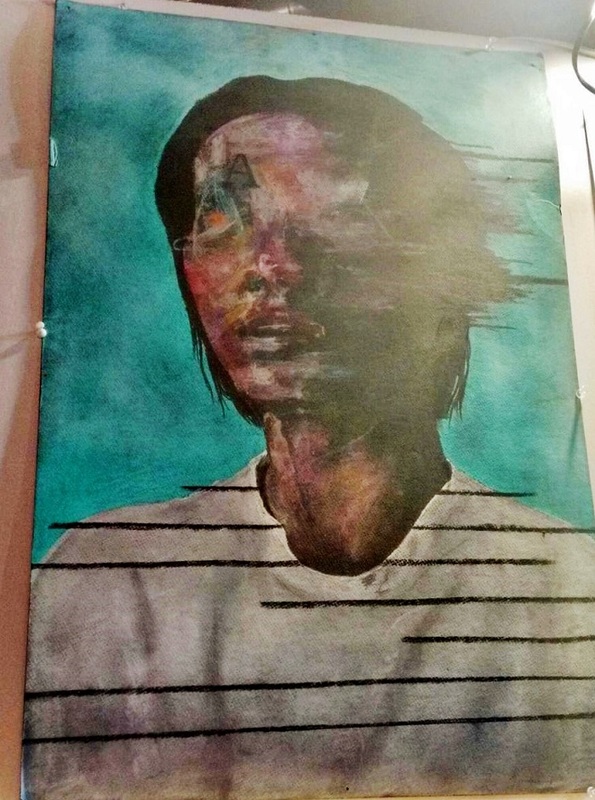 I connected to this painting the second that I saw it. I can almost feel his expression even though most of the face is blurred out. It is as if his head is in motion but his body is very still. The background color caught my attention as well. I have always been a fan of drawing or painting eyes. So it is easy to see why this painting got my attention. The mans eyes are very powerful. It is as if he is looking into my soul and can read me. I love these mixed media artworks! I started out as a portrait pencil artist so I admire these paintings. I especially like how the newspaper on the top painting is peeling off of the females face. It adds a lot of symbolism. I admire this artist for creating these creative art pieces since they are very unique. The patterns and colors are what caught my eye. These paintings are beautifully painted with special attention to detail. I really like how all the attention is focused on the subject. The subject matter is quit interesting especially the large female sitting on a small stool. 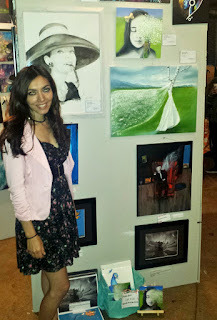 Live painting was a special addition to the show! (If you are the artist, please contact me so that I can give you credit) This event stimulated all of my senses, especially my eyes! I want to thank Pabst Blue Ribbon Beer for sponsoring this wonderful event. I also want to thank all of those who made this event possible (all emerging artist) and especially those that came out and supported the arts!